Portal vein thrombosis (PVT) is a very common, highly morbid vascular liver disorder. Although research has shown that it affects about 1% of the global population, certain high risk groups have a prevalence of greater than 1 in 4. 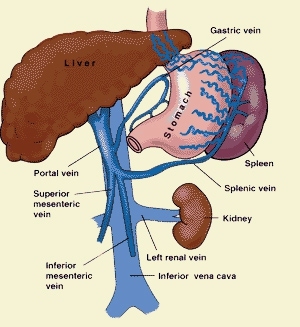 The portal vein is a group of superior mesenteric and splenic veins, whose function is to drain the spleen, as well as the small intestine respectively. Portal vein thrombosis is usually experienced by patients with prothrombotic and/or cirrhosis disorders. Portal vein thrombosis (PVT) is the advent of a blood clot blocking or narrowing the passageway of the blood vessel carrying blood from the liver to the intestine, also known as the portal vein. In some cases, portal hypertension, or the resulting pressure build-up within the portal vein due to the clotting, leads to an enlarged spleen, abdominal fluid retention and/ or profuse bleeding in the oesophagus. Most of the times, there are no symptoms whatsoever. When diagnosed, a Doppler scan confirms the findings and it is then treated with drugs to dissolve the clot. Causes can include cirrhosis, pancreatitis, cholangiocarcinoma, and diverticulitis. It is also a known complication of splenectomy. PVT is most prevalent in patients already suffering a chronic liver disease in which the liver experiences cellular degeneration, called cirrhosis. As the blood which flows through the damaged liver is relatively slow, about 25% of cirrhosis sufferers also suffer from PVT. Common causes of PVT vary for children based on age. New-borns acquire PVT due to infection or complications experienced in the umbilical cord. However, in older children, clotting is usually a result of complication experienced from appendicitis. There are various portal vein thrombosis treatment options. In the event of a quick onset of PVT, tissue plasminogen activator, a form of clot dissolving drug is prescribed. However, the efficacy of such treatment is unknown. For a gradually oncoming disorder, portal vein thrombosis treatment options include anticoagulant, or blood clot inhibitors, working to prevent or halt blood clotting, as a form of ongoing portal vein thrombosis management. Another form of medication prescribed to treat PVT is Octreotide, an intravenously administered drug which acts to diminish the blood flow to the liver in order decrease portal hypertension, thereby preventing or halting the bleeding. Anticoagulant is a form of drug which works to stop coagulation, or blood clotting within the body. There are various scenarios in which anticoagulants are used to prevent PVT, pulmonary embolism, deep vein thrombosis, ischemic stroke and myocardial infarction. There are various risk factors that need to be assessed before prescribing anticoagulants, such as age. Patients over the age of 80 have a higher chance of bleed complications when using anticoagulants. Other risk clinicians often check for before administering anticoagulants is whether the patient is already on any form of blood thing drug which may possibly complicate bleeding. Another form of portal vein thrombosis management is portal vein bypass surgery with shunts. In this case, the most common form of shunt is the portacaval shunts. It is a major surgical procedure which aims to treat portal hypertension by making a passageway between the Portal vein and the inferior vena cava, the major vein that carries back deoxygenated blood back to the heart. In doing this, blood is diverted away from the liver, thereby releasing pressure on the portal vein. Although rare, there are certain complications that can result from portacaval shunts. These include liver failure or haemorrhaging. Another common and more preferred form of portal vein bypass surgery is the transvenous intrahepatic portosystemic shunt (TIPS), in which the portal vein is bypassed through another part of the liver by linking to a vein, draining away from the liver with the assistance of stents to support the links between the veins. A TIP also happens to have a low failure rate and is less invasive in comparison to portacaval shunts. As a result, this is physicians’ preferred method of implementing shunts. If TIPS fails, portacaval shunts is resorted to but is considered to be very high risk, as it is being performed on individuals with pre-existing conditions. Furthermore, only half the patients undergoing portacaval shunts actually survive. Another option for portal vein thrombosis treatment is liver transplant. It is the surgical procedure of removing the failing liver and replacing it with a healthy liver due to chronic liver failure, arising from portal vein thrombosis. There are various risks associated with a liver transplant such as internal bleeding, infection, recurrence of PVT due to complications, Hepatic artery thrombosis or clotting of the blood vessel that brings blood from the heart to the liver. However, chances of such occurrences are low and the procedure has a high survival rate. Furthermore, it is expected that the already well regarded survival should improve further, as advances are made in organ preservation, pre-operative care, surgery methodology and immunosuppression.